Our project proposes organized community clean-ups of Evans Way Park that will provide the material for a sculptural installation. Using recycled glass from Massart’s Hot shop, we want to cast a scale model of the geographic perimeter of Evans Way park, shown at right. This cast shape will be 1 inch thick by 4-6 inches deep and hollow in the center. Each month we will organize a clean-up in Evans Way made known to the school by posters and word of mouth. The trash from the clean ups will be compacted, spread into molds which fit within the glass casted shape, and sealed within layers of resin. These two shapes will fit within either side of the glass casted shape. Solar powered lights will be installed in the space between the two resin layers. Due to the transparency of the glass and resin, blocked partially by the litter, light will interact with this piece in an interesting way. We will be using solar stake lights which operate on a light sensor so that at night, it will glow from within. Conceptually, we want to bring to light the issue of litter in public spaces. In completing this project, we will be transforming waste from MassArt and the surrounding area into a beautiful piece of art, and involving the Massart community in a sustainable project. We are a well-rounded and dynamic team of artists who have been collaborating together for over a year. Combined, we possess skills in illustration, sculpture, photography, film, installation, and have done work involving suspension, use of recycled materials, and glass casting. Additionally, MassArt faculty Christopher Watts will be aiding us along the way providing information about suspension, casting, types of glass, etc. Additionally, a few upperclassmen at MassArt with experience in glass and electronics have and showed interest in collaborating on the project. Fast Fashion is Like Fast Food; bad for people and bad for the environment. Pesticides and chemicals run rampant in the industry, destroying our environment. Natural resources are being devoured in unsustainable amounts. Unfair labor wages and poor working conditions are causing suffering and death for many people. And over-consumption has created 12.8 million tons of textile waste annually. The average American alone throws away 63 pounds of clothing per year. So, how do we fix this gigantic problem? For one, designers must design with sustainability in mind. But, just as important (or more) the consumers have to demand better. As long as there is demand for fast fashion, there will be corporations to supply it. With this in mind, I would like to design and create a 3-5 piece collection bringing the consumer first into the world of fast fashion and its negative impacts, then present a simpl solution on, and finally show how their acons will directly affect positive change. Each piece will weave symbolism and meaning into them. 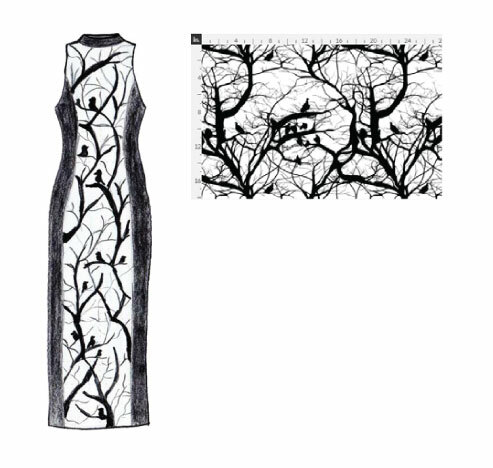 The dead branches and vultures represent how many of the processes in the fashion industry damage the environment. Dangers include the pesticides and herbicides used to treat cotton, to the petrol (plastic) nature of synthetic fibers, the overuse of water, the toxic chemicals of dyes and other fabric treatments, and the dumping of textile wastes into landfills. 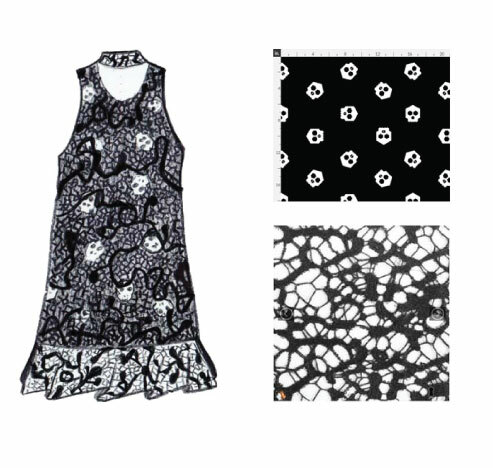 This dress has two main components: the skull fabric shell and the black lace overlay. The skulls represent the damage the fashion industry is doing to people. People are dying in poor working conditions, receive dismal wages, are being affected by the chemicals in the cotton crops, and their surrounding resources are being destroyed and polluted, leaving poor water quality and lack of natural resources to survive. The web-like lace overlay represents one; the shroud in which we put over the suffering of humanity so we can have our trendy looks, and two; the web-like structure of it represents the complexity and complicated supply chain in which the fashion industry works. Consumers need a transparent supply chain to be educated on how their clothes are being made. This look is to provide the solution at the core level. 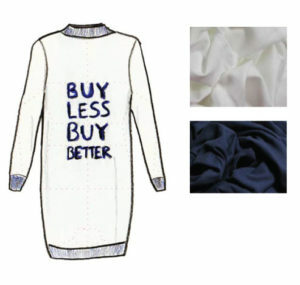 The words BUY LESS BUY BETTER appear on the front to offer the consumer a clear, concise action to help alleviate the problems the previous pieces portrayed. Buy less to reduce the amount we throw away each year; buying only pieces we need that will last for years. Buy better – not only in the quality of the goods, but better in the ways they are sourced, manufactured, and treated. 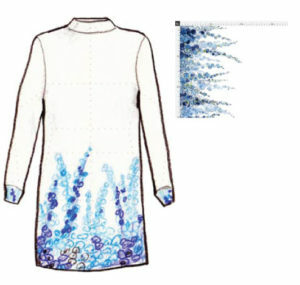 The blue delphiniums adorned on this dress represents that once the consumer starts to buy less and buy better, the environment begins to thrive and bloom. This maxi dress is the final piece in this story. 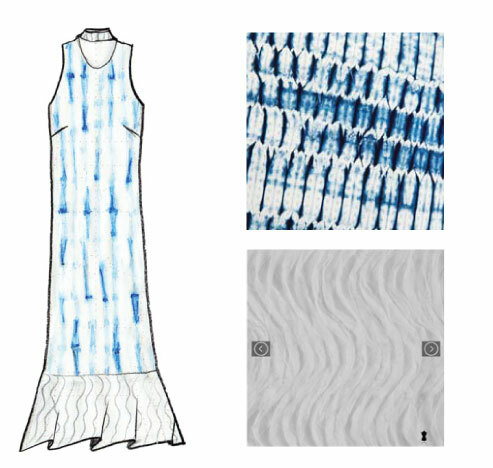 The organic material will be hand dyed using the age old technique of Shibori with natural indigo dye. The use of this me honored technique pays homage to the men and women whose handicraft is well respected. This represents the humanity involved in the industry and how we can honor them by honoring their work. The wavy striped white lace provides the counteract to the web of complex supply chains. 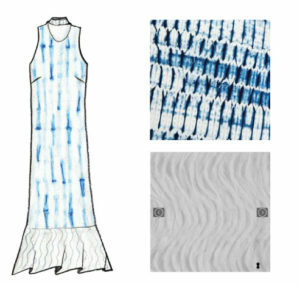 Linear chains that are transparent will allow designers and consumers the ability to see more clearly how their clothes are being made. The fabric used to create this collection will be organic whenever possible and the prints for the pieces will be sourced from Spoonflower. Spoonflower prints on demand, so that no excess printed fabric is created. They also use eco-friendly printing processes. I envision this collection to be displayed in a public space within the MassArt campus, possibly in the Design and Media Center Atrium. There would also be presentation boards posted explaining each piece. To further the reach of the message to the MassArt and Boston communities, I could do a reception with a brief presentation and invite visitors to view the pieces, ask questions, and share thoughts. 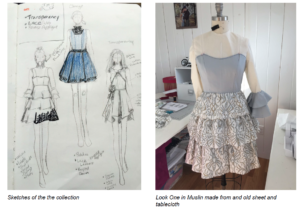 In addition, I would request the collection to be shown at the year-end MassArt fashion show with a brief write up in the program with the story of the collection. This is an important message. If there is no longer a demand for fast fashion, then there will no longer be a market for fast fashion. Educa on is always more effective than regulation. The aim for this project to is to create a multi-story high wall mounted hydroponics garden that will hang on the west side of the Tower lobby or other high-ceilinged rooms on campus. This hanging garden will activate indoor space with color sound and movement during winter and will provide fresh greens for the MassArt community. Hydroponics is a way to grow plants outside of soil by bathing the routes in nutrient rich water. This allows one to sustainably grow vegetables in typically unused spaces. The system will consist of 10 two foot section of PVC pipe hung horizontally with two feet of space in between, like a rungs on a large ladder, above a water tank. The sections will be interconnected with tubing and water will be pumped to the top and the run with gravity down to the bottom cycling the nutrients in the system. Each section will hold 4-5 cups for growing plants. I will grow a variety of herbs and vegetables including peppers to make and bottle Mass Art hot sauce at the end of the project. Currently, I am a teaching assistant for Prof. Saul Nava and I am working on small-scale hydroponics setups in the new lab in the basement of the DMC. Trying out this system on a small scale will allow me to easily scale up to a large system. Also working together with Saul in his lab will give me space and facilities to do things like start seedlings in an incubator, and general support for the project. The piece will be very engaging to the MassArt community. It will be very visible to everyone who passes by and The soothing sound of rushing water and bright green veggies in the middle of winter will attract viewers to discover the sustainability of hydroponics. There will be a scheduled harvest when the vegetables grown by the system will be harvested and turned into sauce that will then be given out to MassArt community members. These harvest parties will serve as a way to inform viewers about the project and demonstrate the benefits of such a system.